This thoroughly Bible-centered unpacking of the reasons for gratitude builds on Mary K. Mohler's 25 years experience in mentoring seminary wives at The Southern Baptist Theological Seminary in Louisville, Kentucky. Section 1: What is gratitude? 4. Too Busy to Bother? Growing in Gratitude is a must read for anyone who has ever doubted, suffered or just plain coasted in life. Starting in the Garden of Eden and continuing throughout the whole span of Scripture, Mary Mohler invites us to embrace the big-dealness of gratitude for those who know Christ. In straightforward, yet deeply penetrating ways, Mary opens the theological doorway to a grateful heart as graciously as she has opened the door of her home to thousands throughout her years of ministry. With perceptive illustrations, she skillfully wins us over until we are “abounding in thanksgiving” (Colossians 2:7) in happy obedience to God’s Word. This book would be a treasure if only for the truth found in her list of “Ten Ways to Thank the Lord When it Hurts.” But read the whole thing! Both your head and your heart will be lifted up into new paths of gratitude. Popular mottos and self-help advice on being thankful abound. 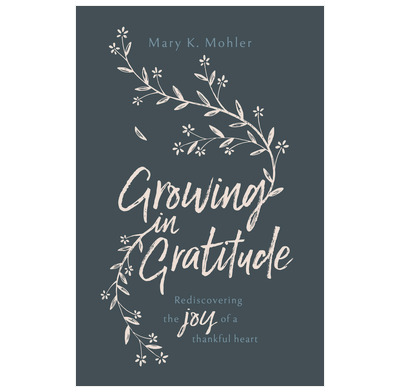 But Mary K. Mohler takes us deeper to explore the theological root of gratitude and the hindrances that keep us from developing a truly grateful heart. In this book, you'll find solid, effective counsel. So listen up! I'm confident you'll be grateful you did. Mary Mohler bares her lovely and redeemed heart in this book. And as I read it, I found myself scribbling notes, making book lists from Mary's recommendations, and stopping to pray in both repentance and thanksgiving. I did this because I want the habits and heart of this book to seep into my own. Simple but not simplistic, profound but not inaccessible, this book shows how Christian gratitude, more than list-making and positive thinking, nourishes believers to become more like our Savior, preparing us to be conduits for his grace. As I was reading this book, I felt like I was sitting with Mary in her kitchen, listening, learning, praying, and thanking God for the unity and beauty and power of the gospel to equip us, truly, to every good work, including the good work of thanking him when agonizing circumstances do not change. Although written for women, all Christians will benefit from this book. A challenging book which I took on holiday. I read just one chapter a day in my QT’s each morning, so that I could quietly reflect. I found it inspirational. It is a great little book with lots of helpful practical ideas to think and act more deeply about being grateful. I am going to purchase more copies of this little gem to pass onto the ladies in our church family.